Indian Navy invites application from all eligible unmarried Indian Male candidates and subjects of Nepal and Bhutan for various Sailor post for the year 2015. 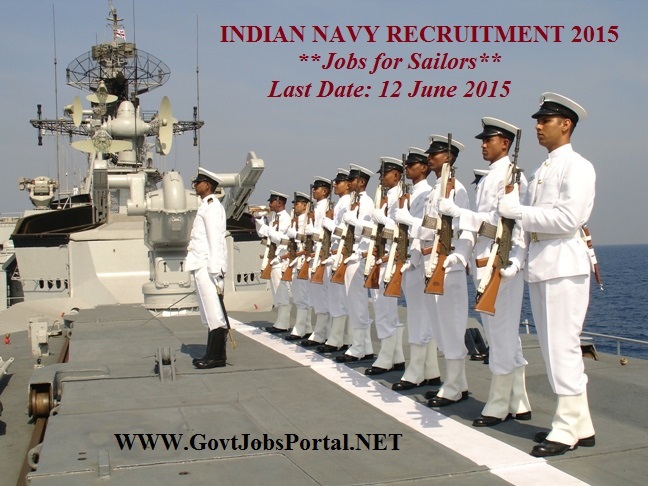 You can read the whole information in detail about this Indian Navy Recruitment notification below in this post. Also must read the detailed official advertisement carefully first before applying. Post Name: Sailor for Artificer Apprentice (AA). Educational Eligibility- Minimum qualification needed- 12th Pass. Age Criteria- Candidate should have been born between 1st Feb 1996 to 31st Jan 1999. Pay Scale- Rs. 5200-20200/- + 2000/- Grade Pay. Selection Process- Selection will be made on the basis of candidate’s Performance in Written Exam, PET, Interview. Applying Process- Interested applicants can apply online through their official website link as given below. After filling up the application form online, print two copies of that application form and send one copy to the following address: “ POST BOX NO 476, GOL DAK KHANA, GPO, NEW DELHI -110 001” with duly attested certificates as required. Last Date for online Registration-12th June 2015.